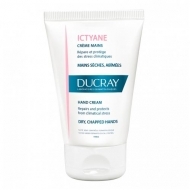 Gives comfort and elasticity to dry and dehydrated skin. 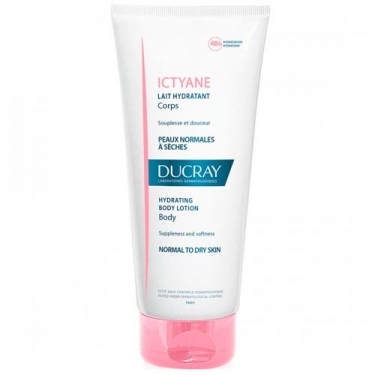 DESCRIPTION: Ictyane Lait Hydratant Protecteur from Ducray is a body milk that reconstitutes the hydrolipidic film of the skin, maintaining its ideal hydration and reducing the loss of water. It participates in the reconstitution of the hydrolipidic film, protector of the skin, and guarantees a great hydration of the superficial layers of the epidermis. 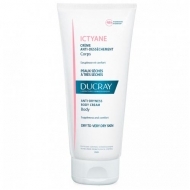 Moisturizing and nourishing, it creates a protective film on the skin. Its formula, with glycerine and liquid Vaseline, has an intense moisturizing effect on the skin. Safflower oil is antioxidant, leaving the skin smooth and youthful looking. No parabens. Ideal for moisturizing the skin after exposure to the sun. Hypoallergenic. Apply daily, morning and / or evening, after bathing, on clean and dry skin.